It’s projects and people like this that make my day, those immersed in their own creative bubble, striving to create products that have life and soul, quality and purpose. Jonathan Legge of Makers and Brothers curates this engaging short film for the Crafts Council of Ireland as a comprehensive curation of Irish craft and design. Here he follows a few familiar faces to us and introduces a handful of new ones also. Our own interview with Irish based shop Makers and Brothers, who proudly present the work of Ireland’s crafts people in their online shop, proved immensely popular with you all, in fact they retail a good number of objects from the individuals found within this film. It’s great to be able to present you all with further context behind these creations, here we see snippets of many of these being made. What I enjoyed most about this short piece is that it didn’t focus solely on one medium of creativity as we get glimpses of furniture, ceramics, glass, weaving and basket makers each given a short section within the film. Unearthing this depth of talent is really refreshing to see, sometimes I worry we are losing all essence of our heritage throughout the UK in terms of handcrafted goods, hopefully projects like this go a long way in inspiring the next generation of makers and designers. The fact that this has been put together to be shown at London Design Week this year is promising news, if you manage to make an attendance look out for the “Place to Gather” section as this film is only a slice of what’s going to be presented. The first individual highlighted within the film is Cork resident Fergal O’Leary who began working independently in 2008 though his own studio, here he creates functional objects with an eye for reduction and simplicity. He references sculptor Richard Serra as a big inspiration to the work he undertakes, along with the Bauhaus, Japanese and Scandinavian design. 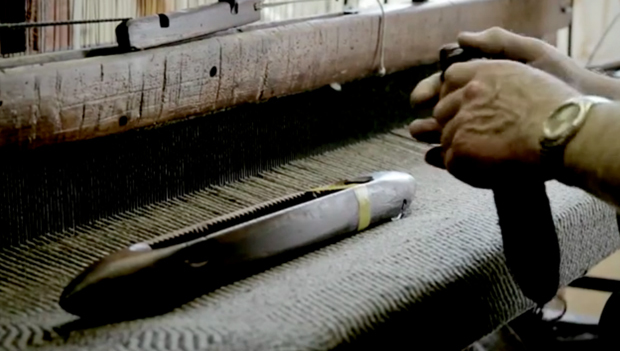 Next up is Studio Donegal which operates as a traditional hand-weaving mill in the Irish village of Kilcar. This was started by Kevin and Wendy Donaghy who strive to maintain and preserve the long running tradition of hand-weaving in the area. In their small village for over a hundred years a mill has existed, they recognised that this craft was an integral part of the social fabric within the South West of Donegal and carry the heritage of those weavers before them in every item they create. A firm favourite of Jonathan and Mark Legge (Makers and Brothers) continues the journey as we hear from Kathleen Mc Cormick, a basket-weaver from Broadford. Kathleen began making willow baskets in her 50’s and she now grows her own material to creates a vast array of styles and uses out of the pliable wood. Initially she was frustrated she couldn’t get her hands on what she wanted, so she took lessons in the art and the rest is well, history. Almost reaching the conclusion of the film you will see Jerpoint Glass Studio a family run business since 1979 who have slowly gained international recognition. Started by Keith and Kathleen Leadbetter Jerpoint run a shop, gallery and studio where they design, create and sell bespoke glassware each day. Last but no means least is a familiar face to us and perhaps to a few of you also: Derek Wilson from Belfast who works as a ceramist from his own workshop. He’s been included in our format a few times previously as his eye for a character defining detail within his own minimal style really resonates with that of our own. His inclusion concludes a captivating and inspiring watch by Jamie & Keith, if you’d like to learn more about Irish crafts and design I’d really urge you to pay Makers and Brothers a visit, as I mentioned above they retail a great number of these creatives. In the meantime I can’t wait to get a glimpse of what else is planned for London Design Week, who knows perhaps we’ll see a few of your there. Enjoy!